The Selective Training and Service Act of 1940 established the first peacetime draft in United States history and required that men between the ages of 21 to 35 register with local draft boards. 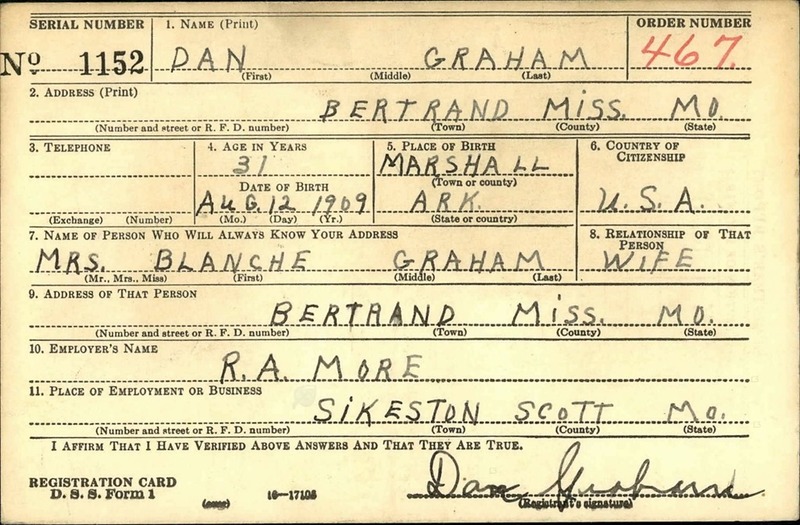 My grandpa, Daniel Graham, was living in Missouri in 1940 and registered with the draft board of Mississippi County. Daniel Graham Draft Card, Recto. Block 1 recorded his name: Dan Graham. Note that he didn’t use his full name, Daniel Page Graham. Block 2, address: No house number or street, but he was living in Bertrand, Missouri. The 1940 Census had Dan still living with his parents in Red River, Searcy County, Arkansas on 1 April, so he was recently moved to Missouri here. Block 4, his age in years, 31, and his date of birth, 12 August 1909. Block 5, his place of birth: Marshall, Arkansas. Block 7, Name of Person Who Will Always Know Your Address; and Block 8, Relationship: Mrs. Blanche Graham; wife. She was the former Blanche Watts, who married Dan in Searcy County, Arkansas on 17 May 1931. Block 10, Employer’s Name: “R. A. More.” Royal Alfred Moore, a farmer in Sikeston, Scott County, Missouri. Daniel Graham Draft Card, Verso. The Registrar’s Report recorded a basic description of Dan. Race: white. Height: 5’ 10½”. Weight: 150 pounds. Eyes: blue. Hair: brown. Complexion: light. 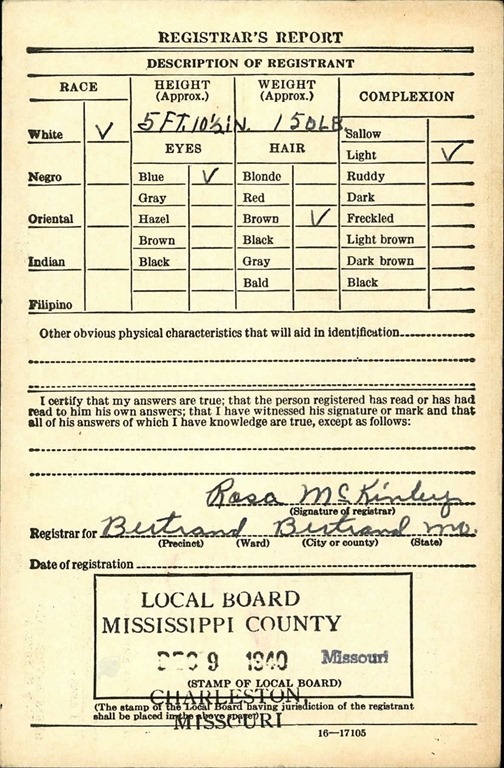 Rosa McKinley was the registrar for Bertrand. She mistakenly also wrote in Bertrand as the name of the county – it should have been Mississippi. She left the date of registration blank, but there is a stamp on the form indicating it was filed on 9 December 1940. Another stamp reads “Charleston, Missouri.” Charleston is the seat of Mississippi County. Ancestry.com. Arkansas, County Marriages Index, 1837-1957 [database on-line]. Provo, UT, USA: Ancestry.com Operations, Inc., 2011. “Arkansas County Marriages, 1838–1957.” Index. FamilySearch, Salt Lake City, Utah, 2009, 2011. Fold3.com. Selective Service Registration Cards, World War II: Multiple Registrations [database on-line]. Provo, UT, USA: Fold3 by Ancestry, Inc., 2012. “Draft Registration Cards for Missouri, 10/16/1940 – 03/31/1947.” 365 boxes. NAI: 7644737. Records of the Selective Service System, 1926–1975, Record Group 147. National Archives and Records Administration, St Louis, Missouri.